I can't tell you how much the kind words you share on our blog and elsewhere propel Edgar and I forward. We truly wouldn't have the courage to pursue our dream without you, and for that we are extremely grateful. 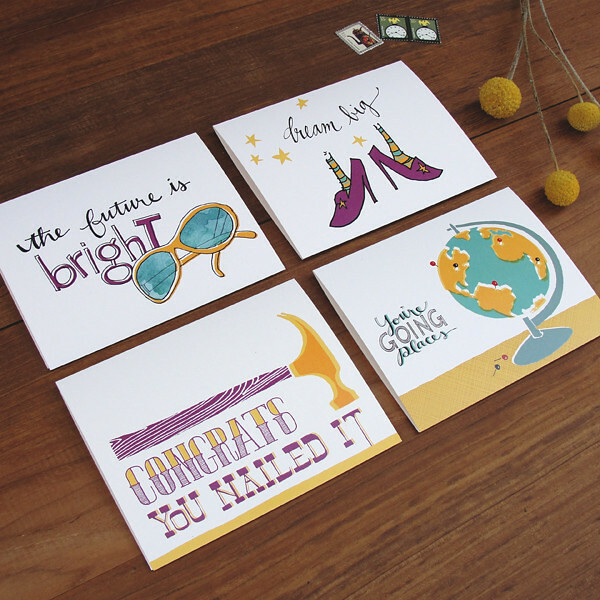 It was also this encouragement that inspired our Encourage and Inspire card set. There are so many moments to celebrate in life (graduation, a promotion, a new home, a leap of faith, a new venture) and, if you're the one doing the growing, it is SO nice to receive a note of support from a friend. As a thank you, we'd like to give away three of these sets to three of you. All we ask you to do is leave a comment below letting us know which card in the set you most identify with (you'll still receive them all). Also, we'd truly appreciate if you'd take the time to share this giveaway with your friends on Facebook, Twitter or Pinterest. Three winners will be drawn at random, from the comments, next Thursday, December 27 at noon Tuesday, January 1! Do you read our blog, but typically don't comment? No worries, we do the same thing on many other blogs. Please do not let this stop you from entering the contest. We're just excited you're out there. Not to sound like a groupie or anything, but I don't think there is much that you two do that I don't find absolutely adorable (including those two handsome boys of yours). At this point in life, I think the "Dream Big" card is the most appropriate. Keep up the great work, guys! i hope to instill a bright future for my son that's why i identify with dream big. Sometimes the present is a little too murky, so being reminded that the future is bright is definitely something I find refreshing! Love to be in the draw, all your cards are awesome. The one I connect with is 'the future is bright' not only is this a great saying but your drawing of the sunglasses is perfect. facebook!! Thanks for offering your wonderful artwork to the world! I like the "you nailed it" card. It's simple. I like the hammer illustration. And it's nice to be congratulated! i'd always love your sketches, it's honest and simple. never had a chance to leave comments or to buy yours via etsy (though i visited your shop few days ago :D). i love "DREAM BIG", but the most suitable card for myself is "YOU'RE GOING PLACES". hehe. I love the note at the end of your post. LOVE the hammer and nail image. Beautiful. Great idea. I love all these cards! But I've always been a dreamer, so I'm choosing "Dream Big". Thanks so much for the fun giveaway! I'm sharing your on Facebook and Pinterest! if you'll consider sending the cards overseas, i'd like to let you know my favourite is "the future is bright" - it's never too much to have such words in a beautiful card, so we can get inspired and gain forces to carry on in dificult times. 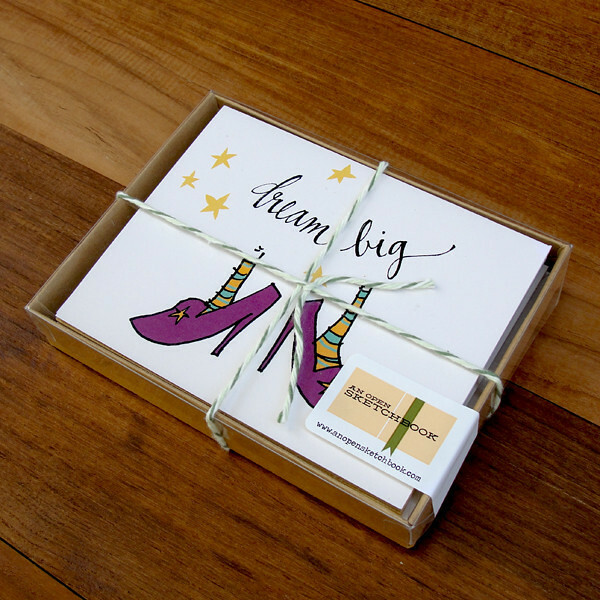 Love the "Dream Big" card:). I can't decide between the two -Dream Big or You're going places. Thx! I love all of your work! My favorite of the group is Dream Big. The shoes are perfect and purple! Much love to you and the boys! Dream Big! An important lesson I learn over and over. Dream Big. That's the card for me. I love the way the striped feet don't quite fit the shoes, but they are in them, nevertheless, full of individuality (stripes) and optimism.